Because this road trip is a loop, you will both start and end your trip in Las Vegas, Nevada. This makes booking your flights and rental cars that much easier. As soon as you are settled into your rental car, you will drive North into Utah to Zion National Park. With amazing vistas and some of the US National Park System’s best hikes, you couldn’t ask for a better park to start your trip. You will then head East into the heart of Southern Utah, where you will see the stunning Bryce Canyon and Capitol Reef National Parks. If you have some extra time to spare, you can also make a side stop in the Grand Staircase – Escalante National Monument. If you haven’t seen them already, I highlighted the Zebra Slot Canyon hike and Long Canyon Slot hike in the Grand Staircase – Escalante National Monument previously. 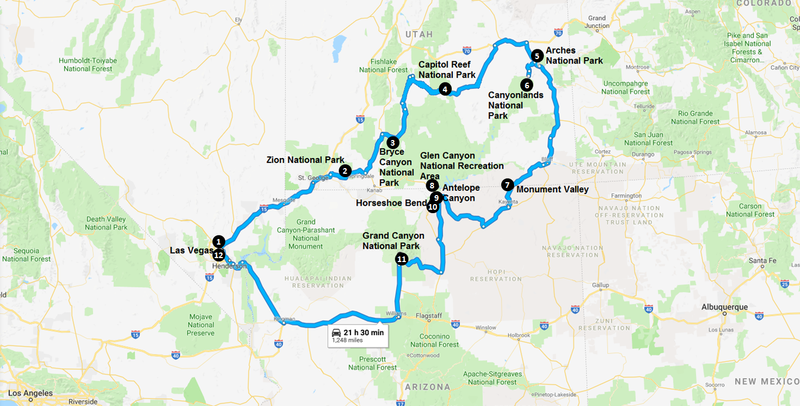 When you are finished, you will drive to the Eastern end of Southern Utah where you will explore the infamous Arches and Canyonlands National Parks. Because these two parks are so close together, you can spend at least a few days in the same spot exploring these amazing landscapes. The town of Moab, Utah is a great place to set up a base camp while you explore this beautiful region of Utah. When your explorations are finished, you will head South to start exploring on your way back to Las Vegas. The first place you will stop when you start heading South will be Monument Valley. Located on Native American reservation territory, this iconic landscape has been used frequently by Hollywood for Western movies. Make sure you read the Monument Valley Visitor’s Guide I wrote carefully as you won’t want to miss a stop at Forest Gump Point, which was made famous by the movie with the same name. After visiting Monument Valley, you will turn West and head further into Arizona. When you get to the town of Page, Arizona, you can set up your base camp and explore the many beautiful landmarks and landscapes that are nearby. This includes the iconic Horseshoe Bend and the stunning Antelope Canyon. To cool off in the warm desert weather, you can spend some time exploring the Glen Canyon National Recreation Area, which is absolutely stunning itself. When you are finished exploring the area surrounding Page, Arizona, you will head to your final park stop of the trip, which is the Grand Canyon. Last, but certainly not least, the Grand Canyon is a place that needs very little introduction. You will want to schedule at least a few days to explore this beautiful park, especially if you plan on doing any hiking. After exploring the Grand Canyon, you will head back to Las Vegas, Nevada to return your rental car and catch your flight home. The total drive time for this park trip is roughly 21 hours and 30 minutes, which can easily be broken up into manageable driving chunks over the course of a few weeks. I would strongly suggest that you schedule at least a few weeks to do this trip as you will want to spend some time exploring each of these beautiful parks. I have included a sample 12-day itinerary below for you to review. Your trip will start with a flight into Las Vegas, Nevada, where you will rent a car and get ready to begin your adventure. If you have some extra time, you can spend some time in Las Vegas exploring. There is something to do in Vegas around the clock and the strip is a lot of fun to explore if you have the time. When you are ready to begin your trip, you will head North towards Zion National Park in Southern Utah. Zion National Park is the ultimate park for avid outdoor adventurers. The landscape and the hikes within the park are extreme, which is why it has become such a popular park for adventurers. I would strongly suggest that you spend a few days in the park as some of the more popular hikes will take you the better part of the day. Among these hikes are the Narrows hike up the Virgin River (pictured above) and the infamous Angel’s Landing hike that made our Top Hikes in the US National Parks System list. Once you have finished exploring Zion National Park, you will head Northeast to Bryce Canyon National Park, which happens to be one of my favorite parks in the US National Parks system. In addition to being one of the most beautiful parklands in the United States, Bryce Canyon has some outstanding hiking trails as well. Make sure you get up early on the day you head to Bryce Canyon so that you can have a full day in the park exploring. The next park in Southern Utah that you will be exploring is also one of the US National Park System’s most underrated national parks. Capitol Reef National Park may not get the press that its sister parks in Southern Utah get, but it is an amazingly beautiful park that is a lot of fun to explore. Be prepared to do some hiking in this park as the most beautiful landscapes are in the backcountry. If you have some extra time to spare, you can take a detour on your way to Capitol Reef and spend some time exploring the Grand Staircase-Escalante National Monument. If you need some ideas on things to see in the Grand Staircase, I have outlined the Zebra Slot Canyon hike and the Long Canyon Slot hike recently. After visiting Capitol Reef National Park to see some of its amazing landscapes, your next stop will be Arches National Park on the Eastern end of Southern Utah. You are going to be spending a few days in this area exploring both Arches National Park and Canyonlands National Park so you might want to look at nearby Moab, Utah as a place to establish your base camp. There are a lot of really great hotel and restaurant options in Moab to choose from. Arches National Park is one of Utah’s most popular national parks, and one of the most popular national parks in the entire United States. Within the park, you will find an estimated 2,000 naturally formed rock arches in the sandstone rock that litters the landscape. The most famous of which is Delicate Arch (pictured above), which is featured on the state of Utah’s license plate. After visiting Arches National Park and seeing its stunning collection of rock arches, you will be spending your second day in the Moab area exploring the other national park in the immediate area. Canyonlands National Park sits just 30 minutes South of Arches National Park, so it is very easy to jump between the parks if you would like. If you like canyons and jaw-droppingly beautiful vistas, then Canyonlands will be right up your alley. There are several viewpoints that give you a really great view of this amazing park (most notable of which is the Mesa Arch viewpoint), but in order to really get a good feel for this park, you will need to do some hiking in its backcountry. So make sure you get to the park early and bring your hiking boots with you. After wrapping up your tour of Arches and Canyonlands National Parks in the Moab, Utah area, you will head South to Arizona to see some equally inspiring landscapes.’ Your first stop as you head South will be to the Navajo territory, where you will check out the legendary Monument Valley (pictured above). This epic landscape was made famous by Hollywood in the old Western films, so don’t be surprised if it looks familiar. After visiting Monument Valley and taking in the amazing views of that area, you will head West towards Page, Arizona, where you will set up your next base camp. There are several things you will be seeing in the area, so plan on spending a few days in Page. The first thing that you will see is the infamous Horseshoe Bend. If you aren’t familiar with Horseshoe Bend (pictured above), it is a sharp turn in the Colorado River as it makes its way South to the Grand Canyon. Like the Grand Canyon, the Horseshoe Bend was carved out of the sandstone rock by the Colorado River over thousands of years. When you visit, be mindful that there are no safety railings at the viewpoint. Each year, many people fall off the edge of the rock cliffs to their deaths while trying to take selfies or stand on the brittle rock edges. Another place you will want to check out when you are in the Page, Arizona area is the Glen Canyon National Recreation Area. If you love desert landscapes and love hanging out by the water, then Glen Canyon is the best of both worlds. This large water reservoir was created by the damming of the Colorado River by the Glen Canyon Dam, and the result is one of the American Southwest’s biggest water playgrounds. In addition to boating, there are a lot of great hikes to do in the area. For more information on what you can do in the Glen Canyon area, please make sure you check out my Glen Canyon National Recreation Area Visitor Guide. The last place in the Page, Arizona area that you will be visiting is Antelope Canyon. This is one of the most beautiful slot canyons in the Southwest and is quickly becoming a tourist hot spot. Like Monument Valley, Antelope Canyon is located on Navajo territory and thus is not public land. In order to view the Upper or Lower Antelope Canyon, you will need to arrange a tour. If you would like more information on how to visit Antelope Canyon, be sure to check out my Antelope Canyon Visitor Guide. The final destination on your American Southwest adventure road trip is arguably the most famous destination of them all. After leaving the Page, Arizona area you will head South to the Grand Canyon National Park. This mile-deep canyon probably needs little introduction as it is one of the greatest natural wonders in the United States. When you visit the Grand Canyon, please note that the park is divided up between the North Rim and the South Rim. If you are visiting in the winter, chances are that the North Rim of the canyon will be closed because of snowfall, but you can still access the park from the South Rim. I would plan on spending at least a few days in the park, especially if you are planning on doing some hiking. After touring the Grand Canyon, it will be time for you to head back to Las Vegas to complete your trip. If you are looking for an additional stop on your way back to Las Vegas, I would recommend checking out the Hoover Dam. This large and beautiful dam generates electricity for much of the West Coast of the United States. For more information on visiting the Hoover Dam, please check out my Hoover Dam Visitor Guide. This is a road trip that you really can take any time of year, but I would say that the Spring months of March thru May or Fall months of September thru November are the best. If you visit during the Summer months of June thru August, you will need to be prepared for very hot temperatures in some of the parks. Likewise, if you visit during the Winter months of December thru February, you will need to contend with some cold temperatures at some of the parks at higher elevation (such as Bryce Canyon and Zion). Both the heat and the cold, icy conditions can make hiking more dangerous. Stunning. Stunning, stunning, stunning. The southwest is almost indescribable in its beauty. I was just at most of those places this last summer (the rest I have been to in the past), and I can attest to how jaw-dropping they are. I’m really a mountain lover at heart, but the places in your post (not to mention the scenic drives between some of those places) give mountains a run for their money. I am the same way! I love being in the mountains, but am so drawn to the Southwest as well because of its beauty. Southern Utah keeps luring me back time-and-time again. I know. It almost hurts physically to see those picture. Why do I live in the Midwest?!? !